So yeah. There are a number of more important articles that I SHOULD be posting to Death Ref right now, but I couldn’t resist this one. Especially since Swedish officials are saying that Elk can become aggressive after eating fermented apples. I like to think that this is a warning. Eventually the animals will all strike back against the humans for all the hunting, the terrible t-shirts that use their images without asking, and five pound bags of beef jerky. LOOK OUT Wisconsin!!!! Posted by John in Death + the Law and tagged animals. Bookmark the permalink. Not that it matters, but “elk” in Scandinavia are what we call “moose” here in the states. I was not aware of this distinction! Good thing this BBC article wasn’t about a billion drunk moose / elk, or we’d really be confused. Nope: We don’t call elk moose in the USA. We call them elk, because they are different than moose, meesies, they have different pieces… You see where I’m going don’t you? Elk and moose are both members of the “Deer” family but are a different species. Elk have antlers or a “rack” in hunting circles than moose and the elk’s rack is more like that of the antlers of it’s considerably smaller cousin, common white tail deer. That’s not to say that deer, say in Canada wouldn’t drink say… BEER and could become as dangerous as moose, or elk. With the proper intoxicant, most species on the planet could become killers. The blue crab is probably a poor example of this and has been omitted from this comment. The moose (North America) or Eurasian elk (Europe) (Alces alces) is the largest extant species in the deer family. Moose are distinguished by the palmate antlers of the males; other members of the family have antlers with a dendritic (“twig-like”) configuration. Moose typically inhabit boreal and mixed deciduous forests of the Northern Hemisphere in temperate to subarctic climates. 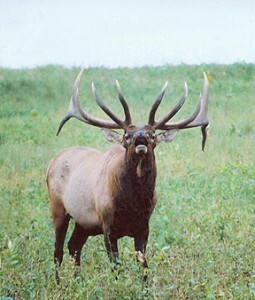 This article is about the North American and East Asian animals, also known as wapiti. For the animal Alces alces, called the elk in Europe, see moose. For other uses, see Elk (disambiguation). The first line in these two separate articles bare out and are consistent in the information for Alces alces, (a creature so nice they had to name it twice): Sorry, couldn’t help myself there. Anyway, it was just a minor inconsistency I felt should be addressed.